What are Index Funds and Asset Classes Investing? This investing series: Best Investing Method using asset classes is based upon the work of Nobel Prize winner Eugene Fama. Fama tested and popularized investing strategies based upon the efficient market hypothesis. In Part 1: What is the Best Investing Method?, you learned the important research behind simple investing with a diversified asset classes portfolio. In Part 3: In Diversification Strategy; How to Figure out my Risk Tolerance you determined your risk tolerance and were introduced to several investment portfolios for each risk tolerance profile. In Part 4; What are Index Funds and Asset Classes Investing? (today), you get a list of sample index funds and tips for asset class investing with index funds. Part 5: How to Buy Low and Sell High – Asset Classes Investing. There are too many index funds available and the choices can be mind boggling. This article will give you a list of index funds to simplify your investments. You only need a couple of mutual or exchange traded funds in your investment portfolio. An index fund is a replica of a current market index. The stock market is categorized into a variety of groups, called indexes. These categories are helpful in analyzing market behavior. The most popular index and the one used most often to represent the total stock market is the Standard and Poor’s 500 or S&P 500. This index contains 500 of the most widely held stocks and attempts to represent the total U.S. stock market in proportion to their market capitalization (or number of shares multiplied by share price). Apart from the S&P 500 the world of indexes and their accompanying mutual funds expand to include sector such as “health care sector,” small capitalization stock, developing world markets, value stock, and many more index funds. For every popular stock market index there are one or more mutual funds and exchange traded funds (ETFs) designed to mirror the particular indexes holdings’ and returns’. In the earlier articles of this Best Investing Method Series you learned how difficult it is to beat the returns of the stock market indexes. That’s great, but how do you know which index funds to choose? There are hundreds of index funds and Exchange Traded Funds (ETFs) in every imaginable format, how does one sort through them all? Fortunately, it’s quite easy to narrow down the index fund universe. Of the vast world of index funds, you decide how simple or how complex you want your investment portfolio to be. One can obtain an adequately diversified portfolio with as few as two or three diversified index funds. In a Forbes article, Rick Ferri wrote about Three Simple Index Fund Portfolios. For those who desire a more exhaustive diversification, a portfolio of eight to ten or more index funds is possible. After a certain point, it’s debatable how much diversification benefit there is to adding more funds. How diversified does my index fund portolio need to be? Most researchers agree that twenty to thirty individual stocks, representing a variety of sizes and industries, provide sufficient diversification. Each additional stock beyond that point offers marginal benefit. Now, think about a diversified index mutual fund with hundreds of holdings and you realize you don’t need to own more than a few diversified index funds. Is There a List of the Best Index Funds? When choosing an index fund, simple is better. Almost every large discount brokerage company has a stable of index funds – Schwab, Fidelity, Vanguard and more. The brand or company doesn’t make much difference. 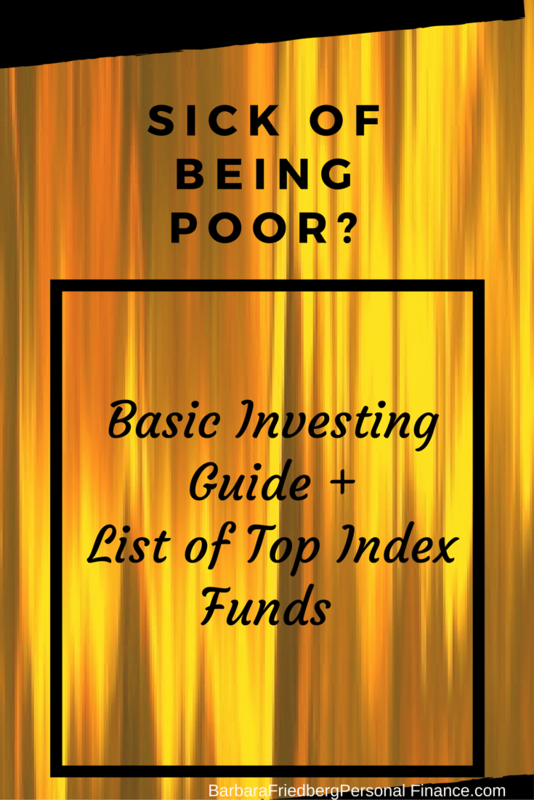 This article will give you a best index funds list to help you narrow down your search. Following are popular asset classes and sample index mutual funds and ETFs for each category. This is not an exhaustive list of all index funds or ETFs. These funds are examples of the types of index and exchange traded funds to use within your asset classes selections. When selecting your list of index funds for investing, examine the management fee and aim for one below 0.10% except for international or REIT index funds, which might charge a bit more. Fees matter. The lower the management fee of the index fund, the more your money is working. Expect to pay from a low of 0.05% for a rock bottom fee – index fund to 1.3% or more in an actively managed mutual fund. Paying over 1.0% for a mutual fund fee and that fund must make 1.0% before you see any return on your investment. In a discount brokerage account, you can buy mutual funds run by other companies. Index fund ETF’s are similar to index mutual funds in that they replicate market indexes. They differ from mutual funds because they are bought and sold throughout the day on the market exchanges and their prices are influenced by supply and demand. That means that during some periods they may sell at a premium or discount to the value of their underlying securities. Index mutual funds are priced once at the end of each day. When buying or selling ETF’s the investor usually pays a commission. So these are not great investments for dollar cost averaging (or investing a set amount every month). Although, some discount brokers are selling certain ETF’s for zero commission. Use this diversification strategy with asset classes investing in your workplace retirement account. 1. Go back to Part 3 and review your risk tolerance. For example: A moderately conservative investor might choose 60% stock investments and 40% fixed asset classes. If you opt for a simple conservative portfolio. 3. Check out which funds are available in your workplace retirement account and/or discount brokerage account. The type of fund is more important than the funds family. Vanguard, Fidelity, Charles Schwab and other fund families all offer similar index mutual funds. 4. Buy or transfer monies in appropriate percentages into the Diversified Index Funds. If you need help with this step, call a representative at the fund company and/or consult with your human resources officer at work. Great info as always Barb. I couldn’t agree with the approach of keeping it simple and basic. The providers of ETFs are much like flies around a rotting animal carcass, they multiply when they sense an opportunity to gather more assets. There are so many new index ETFs and funds that are nothing more than someone’s idea and were conceived in the lab so to speak. HI Roger, I am committed to helping investors narrow their window of potential funds. A portfolio with 2-4 diversified index funds can be just fine! I agree there are so many out there trying to complicate the investing world! I definitely agree with you regarding charges, they must be kept low at all times. I invest 100% of my money on Index funds and the AMC is 0.38% from Fidelity. I am spread between UK, US, Europe, Japan, & Pacific and I always keep my ear to the ground just in case there’s an impending disaster at which point I quickly buy a put option (6 months) just in case something bad happens. What do you think of this strategy? Hi Shobir, Personally, I like the strategy. It’s obviously best for a more sophisticated investor. The only problem I see is that by the time the impending disaster is made public, it’s likely the price of put options has shot upwards. What has been your experience?